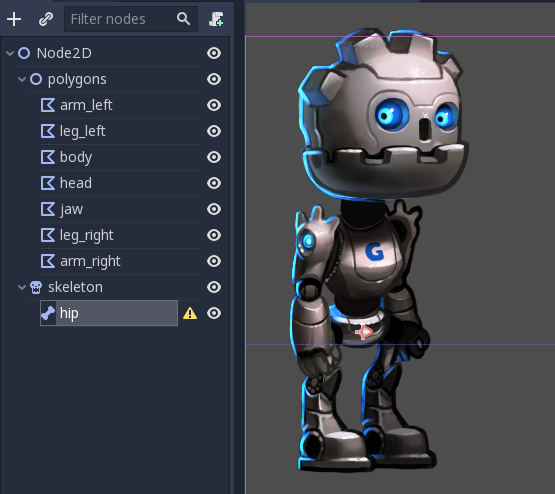 When working with 3D, skeletal deforms are common for characters and creatures and most 3D modelling applications support it. For 2D, as this function is not used as often, it's difficult to find mainstream software aimed for this. One option is to create animations in third-party software such as Spine or Dragonbones. 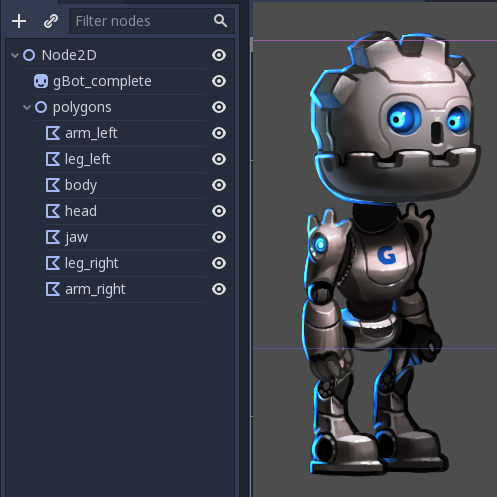 From Godot 3.1 onwards, though, this functionality is supported built-in. Better integration with the engine, so less hassle importing and editing from an external tool. Ability to control particle systems, shaders, sounds, call scripts, colors, transparency, etc. in animations. 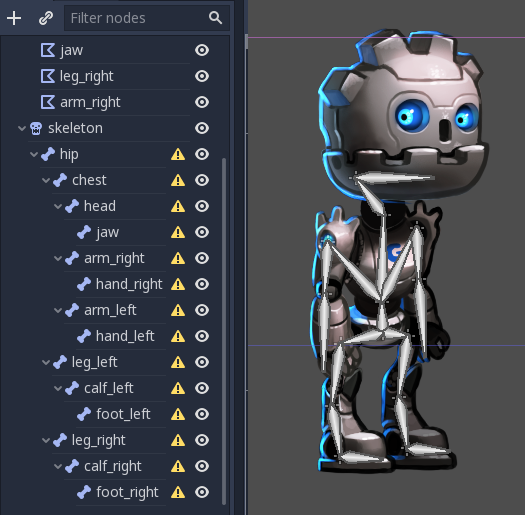 The built-in skeletal system in Godot is very efficient and designed for performance. 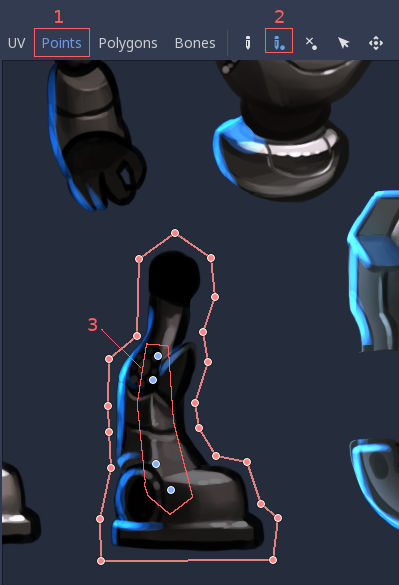 The following tutorial will, then, explain 2D skeletal deformations. 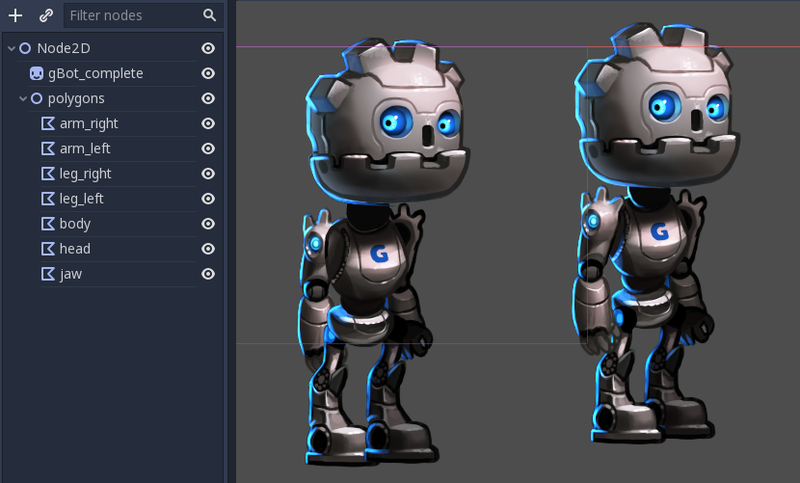 Before starting, it is advised to go through the Cutout animation tutorial to gain a general understanding of animating within Godot. For this tutorial, we will be using a single image to construct our character. 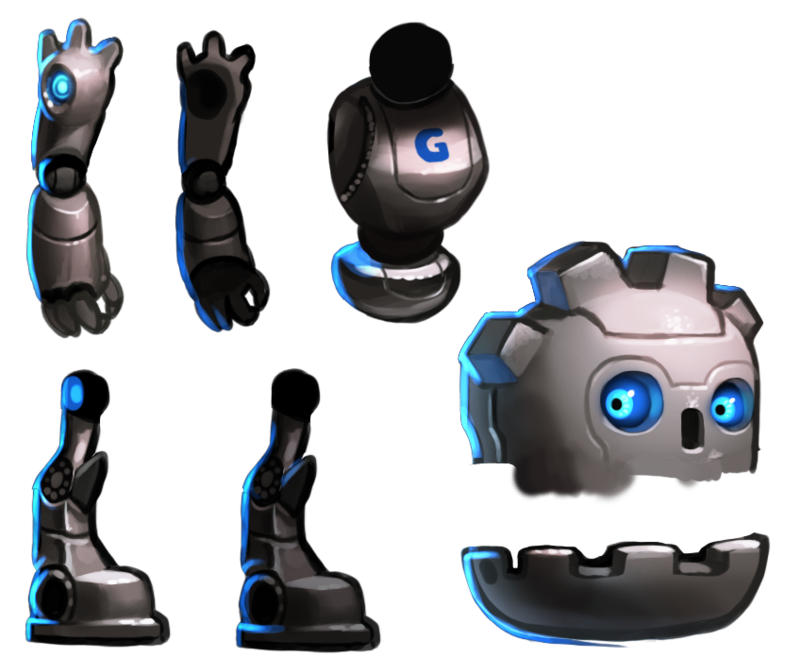 Download it from gBot_pieces.png or save the image below. 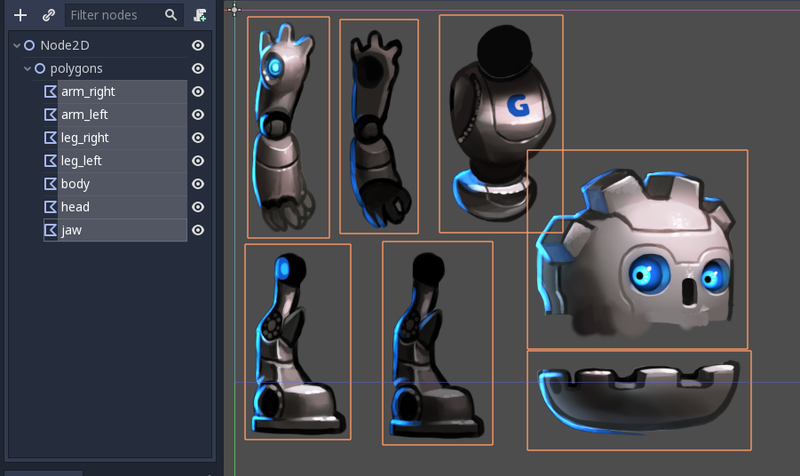 It is also advised to download the final character image gBot_complete.png to have a good reference for putting the different pieces together. Create a new scene for your model (if it's going to be an animated character, you may want to use a KinematicBody2D). 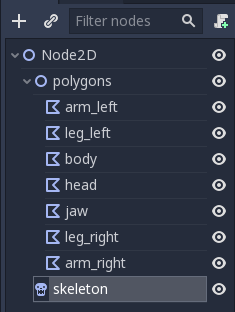 For ease of use, an empty 2D node is created as a root for the polygons. 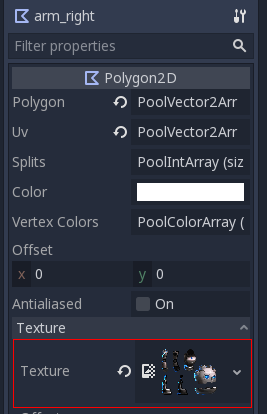 Duplicate the polygon node, rename it properly, enter the "UV" dialog again and replace the old polygon with another one in the new desired piece. Keep doing this until all pieces have been mapped. You will notice that pieces for nodes appear in the same layout as they do in the original texture. This is because (by default) when you draw a polygon, the UV and points are the same. Rearrange the pieces and build the character. This should be pretty quick. There is no need to change pivots, so don't bother making sure rotation pivots for each piece are right; you can leave them be for now. And there you go! It was definitely much easier than in the cutout tutorial. 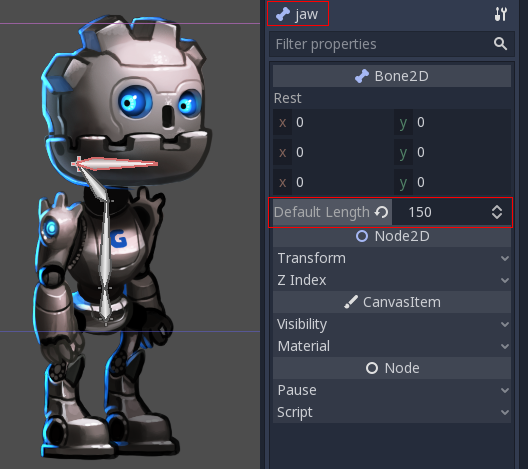 Create a Bone2D node as a child of the skeleton. Put it on the hip (usually skeletons start here). The bone will be pointing to the right, but you can ignore this for now. Keep creating bones in hierarchy and naming them accordingly. 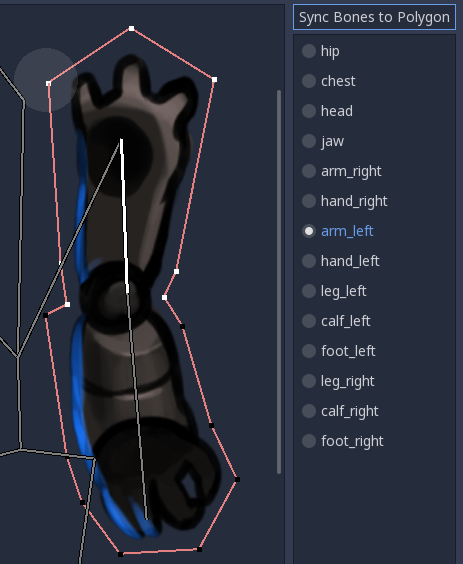 In this case, we don't need to rotate the bone (coincidentially the jaw points right in the sprite), but in case you need to, feel free to do it. 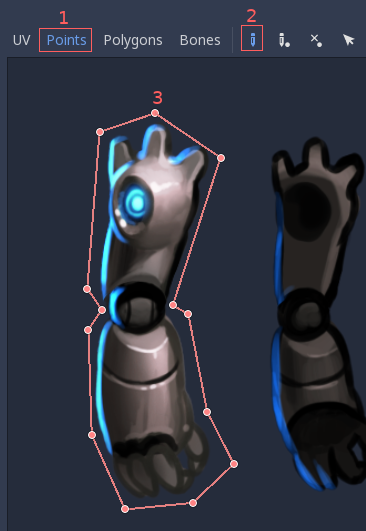 Again, this is only really needed for tip bones as nodes with children don't usually need a length or a specific rotation. The warnings will go away. 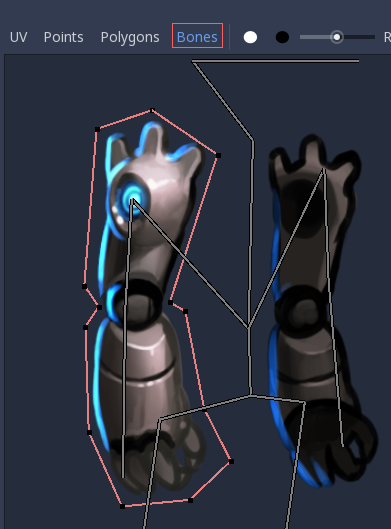 If you modify the skeleton (add/remove bones) you will need to set the rest pose again. 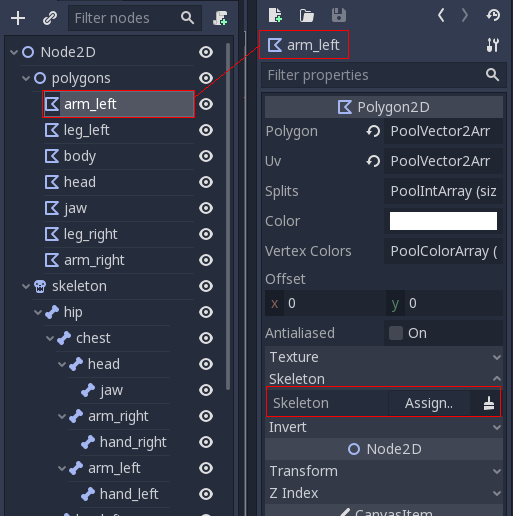 Select the previously created polygons and assign the skeleton node to their Skeleton property. This will ensure that they can eventually by deformed by it. Again, open the UV editor for the polygon and go to the Bones section. You will not be able to paint weights yet. 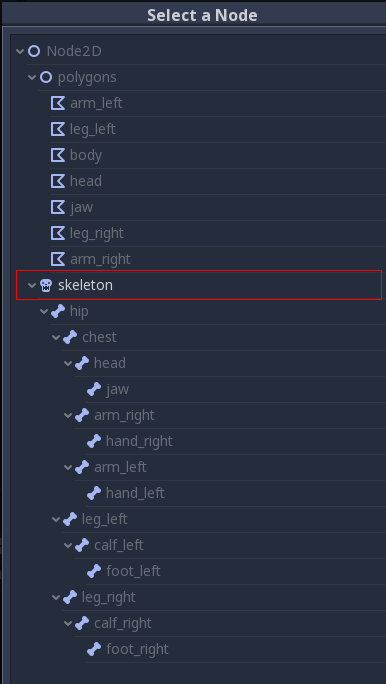 For this you need to synchronize the list of bones from the skeleton with the polygon. This step is done only once and manually (unless you modify the skeleton by adding/removing/renaming bones). 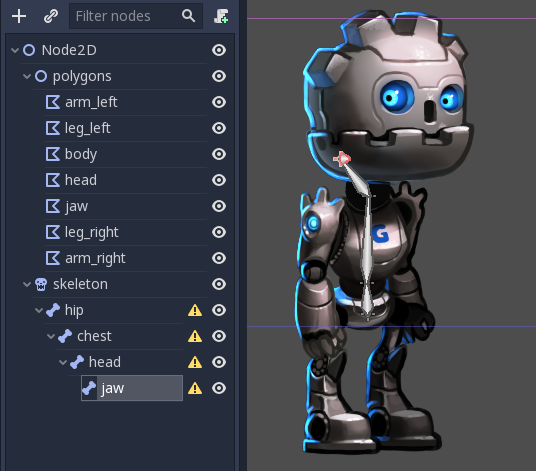 It ensures that your rigging information is kept in the polygon, even if a skeleton node is accidentally lost or the skeleton modified. Push the "Sync Bones to Polygon" button to sync the list. Points in white have a full weight assigned, while points in black are not influenced by the bone. If the same point is painted white for multiple bones, the influence will be distributed amongst them (so usually there is not that much need to use shades in-between unless you want to polish the bending effect). 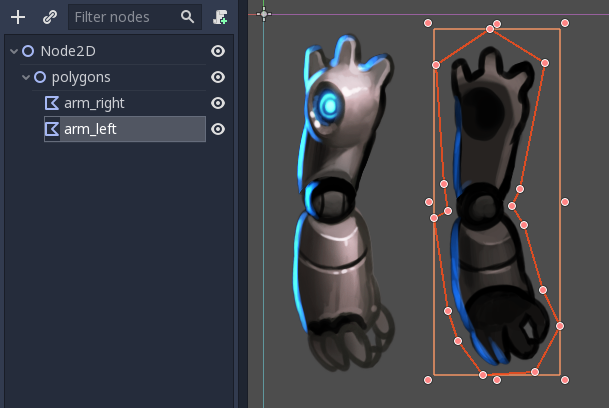 After painting the weights, animating the bones (NOT the polygons!) will have the desired effect of modifying and bending the polygons accordingly. As you only need to animate bones in this approach, work becomes much easier! 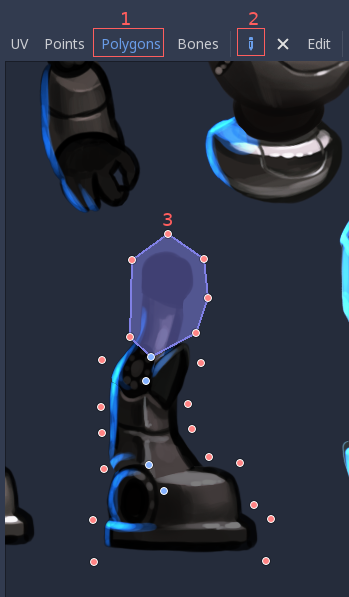 This happens because Godot generates internal triangles that connect the points when drawing the polygon. They don't always bend the way you would expect. To solve this, you need to set hints in the geometry to clarify how you expect it to deform. 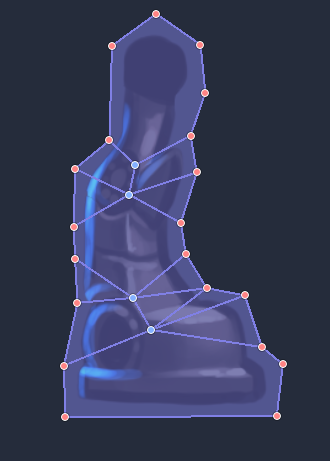 Now, go to the Polygon section and redraw your own polygons with more detail. Imagine that, as your polygons bend, you need to make sure they deform the least possible, so experiment a bit to find the right setup. This amount of detail is usually fine, though you may want to have more fine-grained control over where triangles go. Experiment by yourself until you get the results you like. Note: Don't forget that your newly added internal vertices also need weight painting! Go to the Bones section again to assign them to the right bones.